I’ve played with the composition of the circles theme, which is easy to do when you have a repetitive pattern like this. On these I’ve revisited an idea I had worked on previously in which a strong horizontal creates the instinct to read a piece from left to right (maybe it would be right to left in other places, who knows). Perhaps “narrative” would not be the right word here, but there is the intention of having the work absorbed in a sequential fashion, creating new opportunities to play with from my perspective. 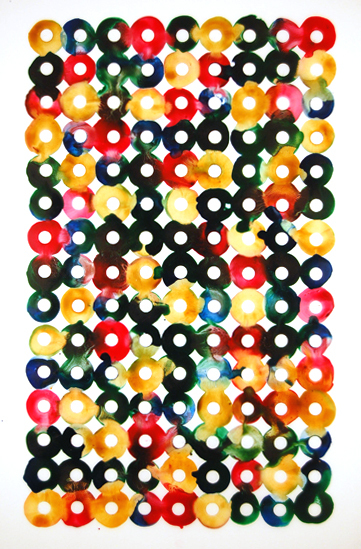 The previous circle works appear as overall, non-focal patterns to be understood as a whole. But the whole is only the invitation to view the pieces with closer inspection. That’s where the intricate natural patterns of the watercolor come into play. The full page becomes a playground for the pigments that have the whole page to traverse around given the criteria of the preordained pattern. Same here, but by limiting the pattern further to a strong horizontal, the pattern itself comes into play as a system of stages. The stages begin, from a reading standpoint, at the left and work their way to the right. What I found interesting about this reduction is that it does appear to be a coded message, a language of some kind that is indecipherable, but a message nonetheless. It almost reminds me of morse code. In this one I reduced my color palette to three colors – yellow ochre, burnt sienna, payne’s gray. I also moved the arm pattern to cover the paper rather than following a trail in the previous piece. 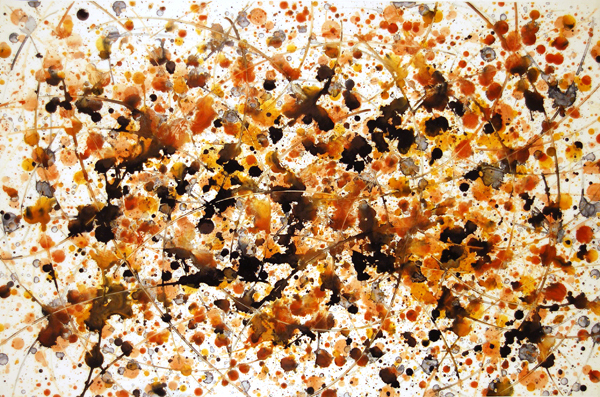 While the piece was enjoyable enough to create, it came out looking like a Jackson Pollock knockoff (circa Autumn Rhythm). This was the first attempt at letting go to the watercolor working it’s magic. There was a time, a recent time mind you, that I avoided the watercolor splatter with full will. It just wasn’t “graphic” enough for my tastes, and had a bit of a slapdash message about it. But I figured out that with the right boldness (after all, that is the trademark of the graphic quality), a splatter could be as graphic as any other mark. So it was in. I’ve been thankful for that realization since and have employed the technique in my work heavily for the last couple years. So when I began looking at the process of letting the watercolors express themselves with a minimum of my influence, one of the first things I tried was utilizing the splatter exclusively in an image. 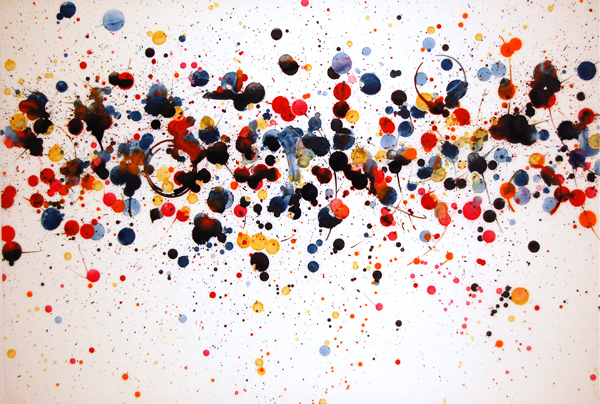 After all, the splatter is a rather random technique that one can’t fully control anyway. In this one, I laid down multiple layers of wet into wet dribbles. Let the colors fall where they will, and where they meet they will create their own identities when the colors co-mingle into new patterns, textures, and colors. I kinda’ sorta’ like what happened. 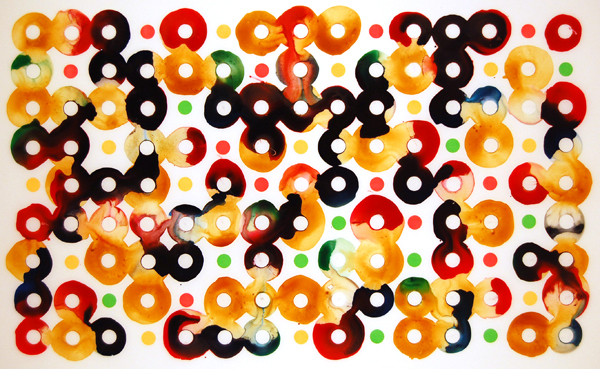 I thought it needed something, and that something eventually evolved into the Circles paintings as below. But there’s still something to this that deserves a second look. Here I just ran my hand across the page with the brush about 5 feet from the flat surface. No real thought other than left to right and occasionally right to left until there was enough water and paint to let it do what it was going to do. You can also see where I laid a couple spray can caps on the paper. Water will follow any line, so the caps gave the stuff a path to follow around in a circle, meeting other wet marks on the paper, mixing, then continuing it’s path around. Even though this is the same size as Circles #’s 2 and 3, for the limitations of a computer monitor this one really shows the dynamic qualities of these pieces. Here you can see how the watercolor medium, unhindered by the absorption of cotton derived paper, really pushes it’s identity forward. With these paintings, I was trying to minimize my control over the final image. I decided to create a grid of circles because it was a “system” that anyone could do, free of individual judgement in creating the realized art. Without the baggage of the artist’s will, the watercolor works within the parameters it’s given to show off it’s distinct qualities. I think of watercolor as a mysterious medium because it is not a substance that one can ever fully understand nor master. It always delivers surprises no matter how much I try to control it. It’s almost as if it has a mind of it’s own. In this way, working with watercolor is not so much a journey of mastering the medium as it is mastering a relationship with the medium, learning to develop a sense of the watercolor’s will in concert with my own. So I often find it important to take a step back on occasion and produce a series that gives the medium full creative license with as little dictation on my part as to what it should do. Call it “assessment” if you want, but like a good conversation that’s been a long time coming, these stops along the way become pillars on the journey. They reveal new potential in the medium in ways I could never have discovered on my own. And sometimes these moments of medium-reflection actually produce nice bodies of work. 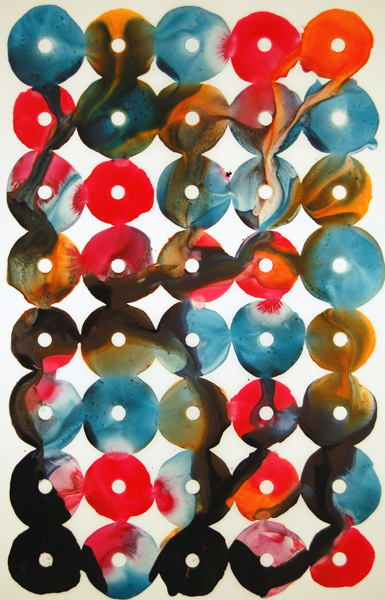 Circles 3, plus 4 other watercolor on yupo works from this series, are currently on display at the new Charlotte Artery exhibiton taking place through November 20th. Events are scheduled Friday November 5th, 12th, and 19th from 6 to 9pm. I will give a short talk on this series on the 12th at 7:00pm.